Our social media strategy consultants in San Antonio address four key points to give your company complete social media exposure. Assess any current social media program and make recommendations on short and long term opportunities. Define social business direction and vision. Develop a program or project roadmap. 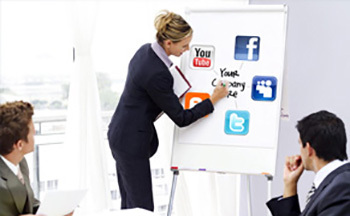 Teach guiding principles and training for social media marketing. Create a dashboard for measuring ROI (Return on Influence and Return on Investment). Assign roles and responsibilities for clear communication and wise use of resources. Conduct stakeholder analysis that outlines management principles and implementation goals for success. Define each team’s roles and responsibilities. Create social media guidance for the company. Integrate social media with other established company teams. Prioritize social media programs for long term integrated strategies that see the greatest results. Outline social media playbook rules, including best practices, dashboard management, resource management, and implementation strategies. Identify and recommend appropriate technological tools for social media. Address planning stages of social media campaigns and manage them every step of the way. Create a comprehensive content strategy leveraging UGC (user generated content) as its base. Establish social media as a vital customer service channel. Identify and engage with brand influencers.